The Racor RK11868 is a Metal Heat Shield that is utilized on the Racor 900MA series and Racor 1000MA series turbine assemblies. This heat shield fits on a Racor RK 11-1606-1. 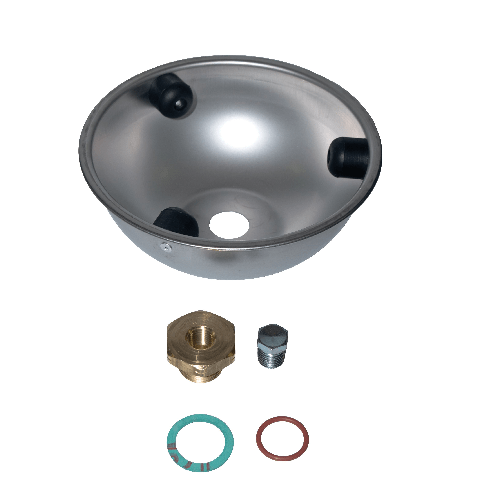 As shown in the image, this part number comes with the following; metal heat shield, brass drain plug (that holds the shield on the bowl) gasket for drain plug, stainless 1/4″ NPT drain plug and gasket. NOTE: These metal heat shields CAN NOT just be added to a 900FG, 900FH or 1000FH series turbine assembly – The bowls are not the same on the stock units. The difference between the two assemblies is that theMA series has a much larger drain plug hole which is filled with a Racor RK11040 brass plug.